Thank you SO much for helping out fami lies in need, in your area, this Thanksgiving! Your donation will be used to purchase food and items that will be included in the baskets. 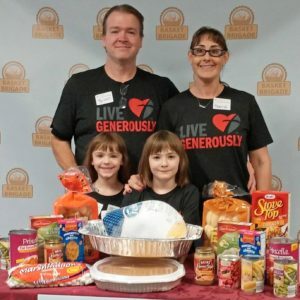 Each basket only costs $50, and will feed a family of five on Thanksgiving Day. Monetary donations are the most efficient way to help and the most needed. Donations are tax deductible to the extent of the law, we are a Non-Profit 501(c)3. 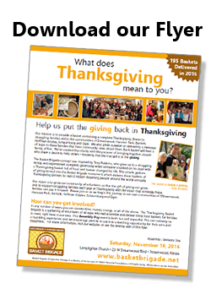 The Basket Brigade of Suburban Chicago is a division of The Lorraine M. Walsh Memorial Foundation, a 501(c)(3) charity. All donations are tax deductible. FEIN: 47-5225925. You can download a copy of our Federal Tax Exemption Letter by clicking the here.